It’s a known fact that companies will reuse artwork on various things. Just think about how many times you see the same promotional artwork every time a new movie comes out. It’s commonplace now for companies to create each character on their own then use Photoshop to place them in various images with different backgrounds to use for shirts, backpacks, cups, posters and more. 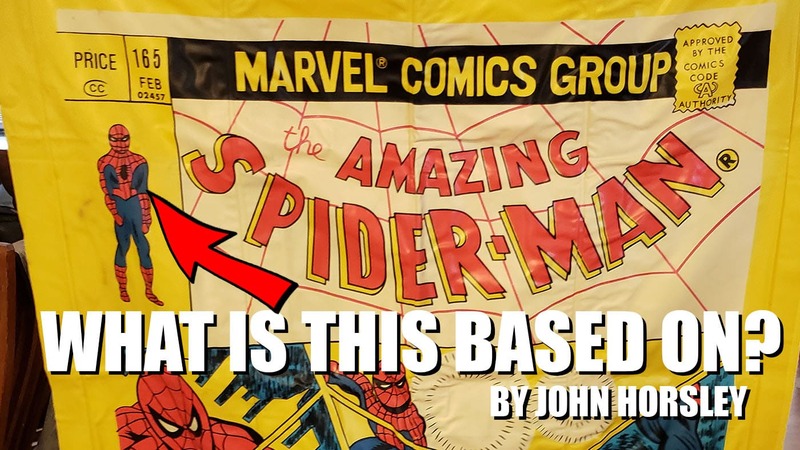 Let’s travel back in time to 1977 and talk about a little known character named Spider-Man. You might have heard of him. He was all the rage and you know why not slap his image on countless products to sell to the masses? Why not take the cover of an issue and put it on posters, shirts, or say a giant 48″ x 29″ inflatable raft to play with in the pool. Not bad at first glance. We look it over, it’s price was removed, it’s issue 165 from February. Good, good. Wait, what’s up with that logo? Why is the S so far away from the P? That’s odd. It also looks a little bubbly from what I remember the bronze age logo looking like. 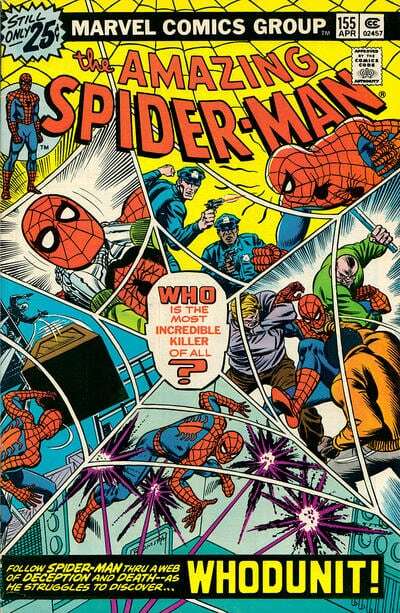 I mean, I wasn’t alive back then but I’ve read my fair share of classic Spidey stories. Interesting cover layout, looks like a bronze age cover style they would of had back then. Let’s look at the card that came with this thing to learn more about it. Oh, they got the logo right there! that’s a good sign! Wait, that’s not how you spell float. That’s how you spell float in Spanish. What’s going on here? Looks like this ‘flote’ was made by the Hampshire Manufacturing Corporation. Sounds American. Oh wait, made in Taiwan. Let’s google this company and see what we find. Whoa, like almost nothing. A bunch of classified ads from the late 1960’s offering jobs for ladies for their clothing lines I think? Also I found a patent for a lined fireman’s jacket, so that’s interesting. I could not really find any information about this company that was relevant to why they made this inflatable? If you know anything about the Hampshire Manufacturing Corporation I would love to know as I want to know more about this thing. Moving on to why I REALLY want to right this post. THIS is Amazing Spider-Man 165. You’ll notice the month is correct, it did come out in February. But the cover is completely different. I get it, maybe that much black was to hard to print on the vinyl back in the last 70’s? 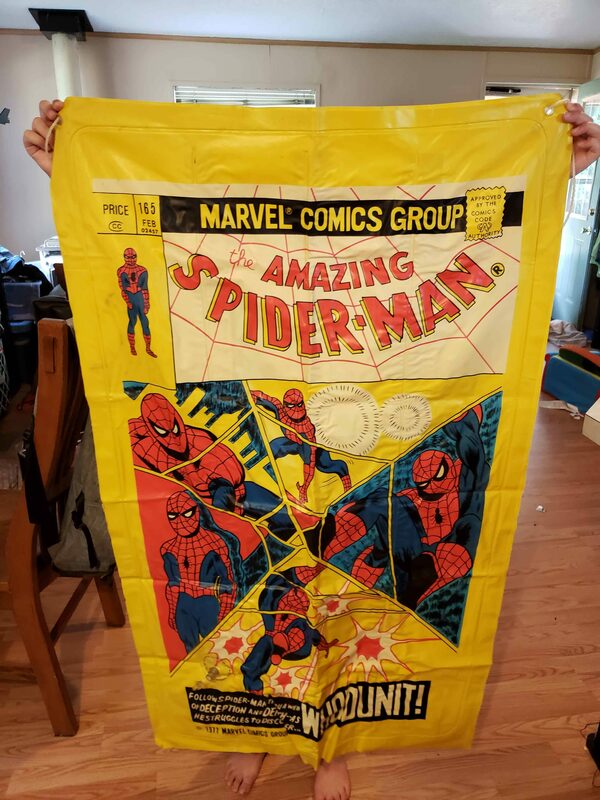 I mean this has a cover date on February 1977, and the inflatable has a copyright date of 1977 and February as the date of the ‘cover’ on it, so this should line up, but they are just so different. I mean the inflatable has like ZERO dinosaur skeletons on it, but like 4 more Spider-Men. What gives? Why would they use a completely different cover? Did they think no one would know? 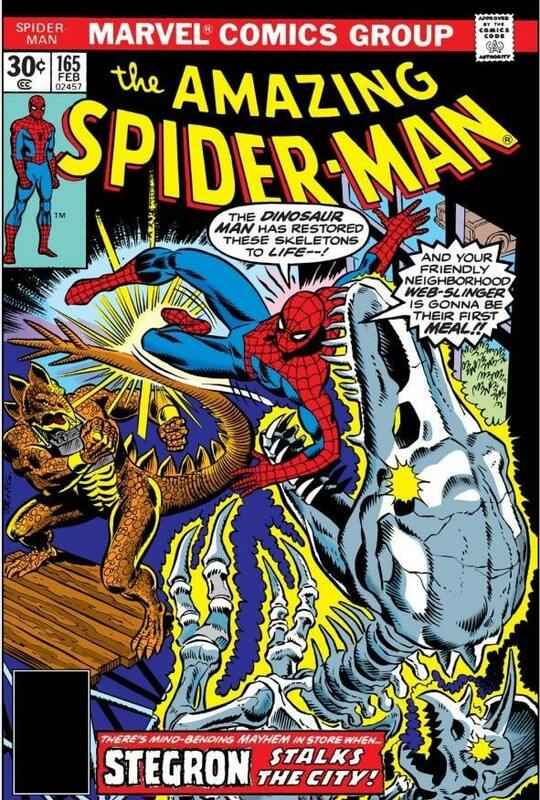 That the kids reading Spider-Man it the late 70’s couldn’t tell the difference between Spider-Man fighting dinosaurs and Spider-Man looking sullen in web shaped panels? 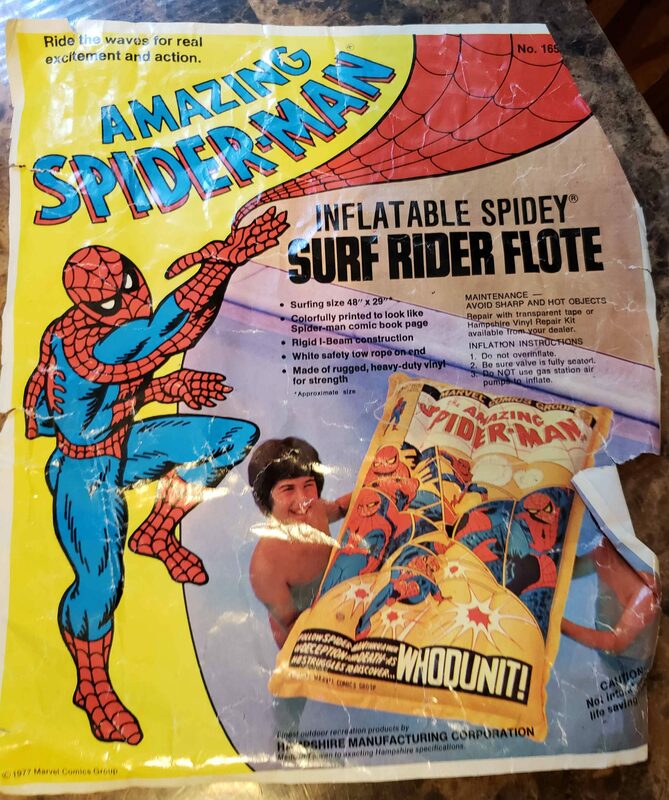 I wasn’t satisfied with just knowing that it wasn’t the real issue, so I wanted to hunt down and see if it was an earlier issue that was used for the inflatable and just the wrong number was used. I can see that, find a graphic they wanted to use but for some reason they had to re-do the text and the number get’s put in wrong, no big deal. You can see it there on the right. Looks very much like it, only not. I mean the head dress of the issues is all wrong on the inflatable. This was from April 1976, when Marvel was still using the top bar to house the issue numbers and had not moved over tot he boxes on the upper left of the covers. There is a lone Spidey next to the logo, just like on 165, only this one isn’t in a box, he’s in a circle. Wait, look at the panels. They are all different too. Ok, actually, hold on. Before we get to the panels, let’s compare the logo Spidey real fast. That’s…did someones kid draw that for this? I mean it’s a good attempt and copying it but it kind of lacks the “Marvel Form” if you know what I mean. This just screams “Spooder-Man”. Let’s compare the cover to 155 to the full image of the inflatable, see how it stacks up. You can clearly see an attempt was made. One can also see that it’s clearly not the same artwork that was used on the cover. Only in this case YOU WERE SUPPOSED TO MAKE IT LOOK COPIED! 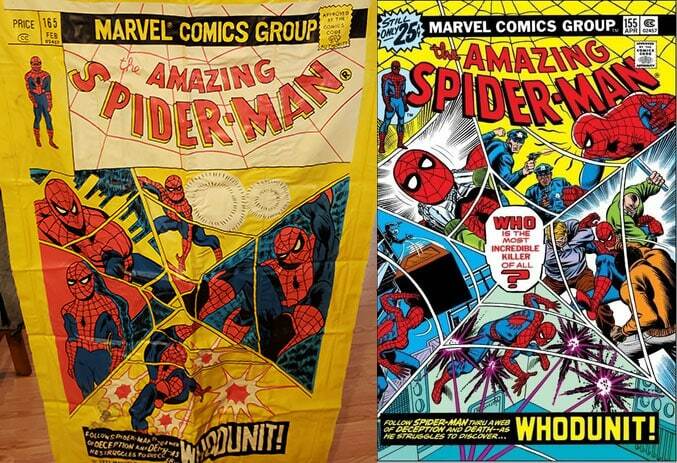 Cause you know, you HAD THE AMAZING art of John Romita to use as inspiration. And you messed it up on every turn. I mean, maybe the art direction was “look at this cover, now go mess it up in every way possible” and if so bravo generic artist from the Taiwan studio that did this for the Hampshire Manufacturing Company. (Side note, I would LOVE to find out who the artist was on this and ask them “WHY”). 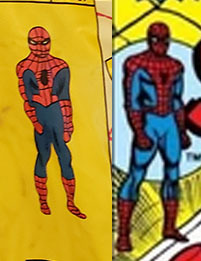 If this was a floaty form the 1960’s where Spider-Man was still new and mistakes like this could be overlooked cause you know, Spidey wasn’t 14 years old and could CLEARLY have awesome looking artwork to use, I might forgive it some. But this was 1977, I KNOW they could do better! I mean, just use the freakin’ cover art! If you can’t print certain colors, FINE! just print it without them! but the line art should still be awesome! The bronze age had some of the most amazing artist and you give us this crap? SHAME on you Hampshire Manufacturing Company! For Shame! On that note, I will end this article and go back to my love of finding obscure things and obsessing over them. ← Thanks for trolling us KEVIN SMITH!